When I started reading Marvel comics properly I started reading around the time that Avengers vs X-Men had started and at the end of that Hope and the Scarlet Witch used the Phoenix Force for something good and that was to make more mutants. This had me a bit confused when I finished reading the issue and I decided to do some research and read up on what happened in House of M, and a few years ago I picked it up and thought that it was okay but the ending is what makes it good for shaking up the Marvel universe. So, let’s see how this all started by looking at House of M #1. The cover for it is alright, it’s just the Avengers and X-Men standing on what appears to be either a cliff or possible on top of peak or in crumbling city. However, the alternate cover is a lot more better as it features Scarlet Witch and her face and hands breaking away from her body, almost as if she is losing her mind and control of her powers. The issue opens with Scarlet Witch in labour giving birth to twins and we see her later in bed surrounded by fellow Avenger members celebrating their births. But the celebrations get cut short when Professor Xavier comes in telling Wanda to put it back and that she doesn’t have any children. Wanda tells him no but Xavier keeps telling her to put the world back, which Wanda then does, through Xavier’s possible help, as that reality comes crashing around them and we see Wanda collapsing saying that she had killed the Avengers, one being her husband, with these events happening during the events of Avengers: Disassembled. We find out that Xavier has returned to Genosha to rebuild a haven for the mutants where Magneto is also there. He tells Magneto that Wanda’s abilities are getting out of control and she doesn’t seem to be getting any better and they can’t keep on psychically putting her to sleep. Magneto apologises to Xavier saying that this is all his fault since that it was his fault that he put his children through all this mess so that they now can’t have a normal existence and he just floats away into a possible exile. In New York City, Ms Marvel, Wonder Man and Falcon have been invited to the new Avengers Tower and question why they have been requested. Meanwhile at the top of the tower, the X-Men have landed and we see that for this X-Men team consisting of Beast, Emma Frost, Cyclopes, Wolverine, Kitty Pride and Colossus. Cyclopes asks Wolverine why the Avengers have invited them here but he tells him to wait a few seconds but it appears that Emma knows, but I don’t know since that in my copy the bottom of the page seemed to be cut off since that there seems to be half a panel that is missing and in a good two-page spread we see the Avengers with Xavier roughly in the middle and Kitty running over and hugging him. Cyclopes asks why he is here since that apparently there was a rift between them. Xavier then explains that he had gathered the two team together to discuss the fate of Wanda. Back over in Genosha, Pietro is looking after his sister where Magneto asks him why he is here and he reveals to him that the Avengers and X-Men plan to kill her and he isn’t happy about it at all. But Magneto thinks that this could be the right idea since that it would a way to stop her powers from going haywire. But Pietro pledges that he will protect her from both him and the Avengers. But Magneto asks him what he would do and Pietro then breaks down at his father’s feet as he is slowly realising that there isn’t anything that they can do. Back at Avengers Tower there seems to be a split decision on what they should do with Wanda since that there are members of the Avengers that think that this rather inhumane since that they are still dealing with a person that most of them would call friend. Emma asks Xavier, as he is the most powerful psychic on Earth, if he can help her, he replies saying that he wouldn’t have had to arrange this meeting if they had. Emma then turns her attention to Doctor Strange asking if he might have been any help with the mystic arts, but apparently, he is still looking into finding a solution. Captain America says that they should let Doctor Strange continue looking into a mystic cure but some of the X-Men think that it would be a waste of time since that they are fighting against the clock. Emma comes up with the suggestion that it should be up to a vote, which makes sense since that she was a part of the Avengers, but she is also considered to be a threat to the mutants as well as humans. But the vote doesn’t happen as both teams still are at heads with each other with the Avengers having their reasons to not want to kill Wanda, with Wonder Man’s previous relationship and Janet and her having a sister connection. This then leads to the idea that they should ask Wanda what they should do, which is a good and stupid idea since that this would mean that they could get her to do the old Star Trek motto of ‘The Needs of the Many’ or she could just use her powers and destroy all of them in one fell swoop. They head to Genosha where they discover something more worse, Wanda isn’t in her bed or even on Genosha and then all Hell starts to break loose as when they start trying to find where Wanda is, Xavier goes missing. Emma discovers where Xavier is, luckily, he is still in Genosha, and they head out where they have a location, which leads them to what appears to be a church. Doctor Strange still hasn’t sensed Wanda since that in the past she has used mystic patterns but this time he isn’t sensing anything what so ever, but Emma is certain that they are inside. Spider-Man’s senses start to go off as they head into the church and we get something rather different for the series as we get two-pages of just images without text and Spider-Man seeing a white light. After the next page of the light getting bigger, we see Peter waking up to the sound of a baby crying and a woman saying that it is his turn, and as we see it turns out that Peter is now married to Gwen Stacey, ending the issue. For a first issue, I do really like it since that it brings up a lot of problems that have happened in previous stories. But the thing that I do really like that was explored for the issue was dealing with an issue that was close to the not only the Avengers but also the X-Men and from what I remember, I don’t think that had happened at that point. Ever since X-Men Origins: Wolverine I have thought that they could have done a better job with Wade Wilson ( portrayed by Ryan Reynolds). To be really honest he didn’t do the best job as the Merc with a Mouth and when he got turned into the muttie known as Weapon XI I thought it just looked terrible. But here are my 5 reasons why there should be a rebooted Deadpool. In the past few years some Marvel finds have done really well with rebooting such films as the Captain America and Spider-Man which have went over good with film fans. 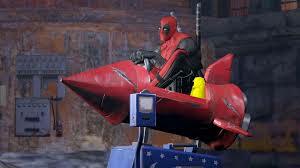 Also the new X-Men film series doing well there would be a chance that a Deadpool film would do well. With Deadpool’s past story lines there are many that can be adapted to the screen. Starting with a true origins story instead of being dropped into a film with out much of a back story. Then in later films adding more of his rouges and allies in next films would make the series more better. I’ve been playing the video game and read a few Deadpool comics and the comedy within it is quite good and hilarious in itself as he is one of the few character’s that has a inner monologue/ dialogue that makes him even more funnier. With the announcement of X-Force film it could hint a future spot for Deadpool. Also cause the film’s main character is the futuristic Cable it could lead to a crossover film. With Ryan Reynolds being casted in Origins he only had one good line, but I believe that there are many better actors that can be the Merc with the Mouth.